In the sequence of surface aesthetics—anatomy—operative techniques, anatomy is at the center for a very good reason. The alar cartilage anatomy determines the surface aesthetics of the tip, and surgical techniques are performed on the anatomy to achieve the refinement that patients want. The number of surgical tip techniques has exploded in the past decade, and our concepts of tip aesthetic have also progressed. Fortunately, our knowledge of the surgical anatomy of the alar cartilages has also increased dramatically. We now know that the columella is really divided into three components: the columellar base, the footplate segment (supported by the base), and the columellar segment of the medial crus. The middle crus must be recognized as a distinct entity; tip asymmetry is often within the lobular segment, whereas the locus of tip suturing is the domal segment. For decades, surgeons considered the lateral crus as a structure to be incised or excised. Subsequently, a wide range of grafts and sutures were developed to modify the lateral crus, but more recently its preservation has become desirable. Turn-under flaps and turn-over flaps have been devised, as well as the technically demanding alar transposition procedure. Cadaver dissections have revealed the existence of the accessory cartilages and their inclusion in the alar ring. 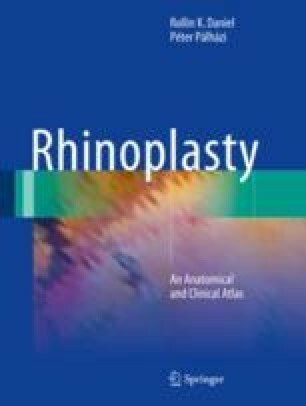 Functionally, rhinologists have long stated that “as the septum goes, so goes the nose,” whereas rhinoplasty surgeons are very aware that “as the tip goes, so goes patient happiness.” The surgeon who understands the alar anatomy will be able to execute advanced surgical techniques that produce superior results.